Shirts With Random Triangles: Report: Lane Kiffin Turned Down Offer To Become Offensive Coordinator At UCLA. Report: Lane Kiffin Turned Down Offer To Become Offensive Coordinator At UCLA. 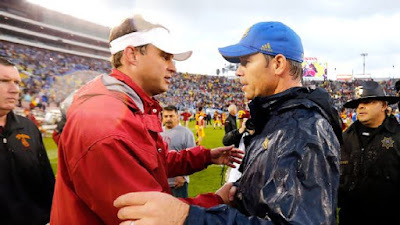 Lane Kiffin and Jim Mora Jr. back in 2012. Image via ESPN. Did UCLA seek to fill its then-vacant offensive coordinator's position with Alabama OC Lane Kiffin? That's what a report from ESPN's Brett McMurphy claims. McMurphy cites the usual unnamed sources for his story, which claims Kiffin turned down a chance to return to Los Angeles the OC of UCLA head coach Jim Mora Jr's coaching staff. Kiffin was head coach of the Bruins' inner-city rival USC from 2010-2013, before being unceremoniously fired following a 62-41 loss to Arizona State in the Week 5 of the 2013 season. UCLA announced on Wednesday that it had promoted Kennedy Polamalu, the Bruins' running backs coach, to become the team's OC. He replaces Noel Mazzone, who left to become OC at Texas A&M. Polamalu is the uncle of former Pittsburgh Steelers safety Troy Polamalu. Kiffin had tried to defuse any future speculation about his employment status last Saturday during a media session held as part of the lead-up to Alabama's victory in Monday's College Football Playoff title game. "I have a great job," Kiffin said. "So anytime that stuff comes up, I remind myself that I have a great job with great players and a great head coach, and there are only two teams still playing, so we're fortunate to be here." The unfortunate news coming out of all of this is that college football fans won't get to experience any kind of awkward drama at UCLA seeing Mora and Kiffin trying to work together. The'll just have to be content with Kiffin remaining in Tuscaloosa, Al. as OC under Alabama head coach Nick Saban.